With vehicle details so we can help ensure this part fits your vehicle - we aim to respond within 2 working hours. 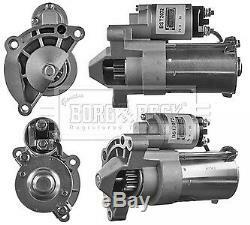 LADA NIVA 1.9D Starter Motor 93 to 99 B&B. CITROËN BERLINGO / BERLINGO FIRST Box (M_) 1.8 D (MBA9A, MCA9A). CITROËN BERLINGO / BERLINGO FIRST Box (M_) 1.9 D (MBDJY). CITROËN BERLINGO / BERLINGO FIRST Box (M_) 1.9 D 70 (MBWJZ, MCWJZ). Model year from: 09/1999; Model year to: 12/2007; Engine Code: WJZ (DW8). CITROËN BERLINGO / BERLINGO FIRST Box (M_) 2.0 HDI 90 (MBRHY, MCRHY). CITROËN BERLINGO / BERLINGO FIRST Box (M_) 2.0 HDI 90 4WD (MBRHY, MCRHY). CITROËN BERLINGO / BERLINGO FIRST MPV (MF, GJK, GFK) 1.8 D (MFA9A). CITROËN BERLINGO / BERLINGO FIRST MPV (MF, GJK, GFK) 1.9 D (MFDJY). CITROËN BERLINGO / BERLINGO FIRST MPV (MF, GJK, GFK) 1.9 D (MFWJZ). CITROËN BERLINGO / BERLINGO FIRST MPV (MF, GJK, GFK) 1.9 D 4WD (MFWJZ). CITROËN BERLINGO / BERLINGO FIRST MPV (MF, GJK, GFK) 2.0 HDi 4x4 (MFRHY). CITROËN BX (XB-_) 1.8 D. Model year from: 03/1987; Model year to: 04/1991. Model year from: 09/1983; Model year to: 04/1991. CITROËN BX (XB-_) 19 D. CITROËN BX (XB-_) 19 E. CITROËN BX (XB-_) 19 E 4x4. CITROËN BX (XB-_) 19 GTi. CITROËN BX (XB-_) 19 GTi 16V. CITROËN BX (XB-_) 19 GTi 4x4. CITROËN BX (XB-_) TRD Turbo. CITROËN BX Break (XB-_) 1.9 D.
CITROËN BX Break (XB-_) 1.9 DT TXD. CITROËN BX Break (XB-_) 16. CITROËN BX Break (XB-_) 18 D. CITROËN BX Break (XB-_) 19. CITROËN BX Break (XB-_) 19 4x4. CITROËN BX Break (XB-_) 19 Cat (AZE151). CITROËN BX Break (XB-_) 19 D.
Model year from: 01/1990; Engine Code: XUD9. CITROËN BX Break (XB-_) TRD Turbo. CITROËN C-CROSSER (EP_) 2.2 HDi. Model year from: 06/2007; Model year to: 12/2012. CITROËN C-CROSSER ENTERPRISE 2.2 HDi. CITROËN C15 (VD-_) 1.8 D. CITROËN C15 (VD-_) 1.9 D. CITROËN C15 Estate 1.8 D. CITROËN C25 Bus (280_, 290_) 1.9 D. CITROËN C4 Coupe (LA_) 2.0 HDi. CITROËN C4 Grand Picasso I (UA_) 2.0 HDi 138. CITROËN C4 I (LC_) 2.0 HDi. CITROËN C4 Picasso I MPV (UD_) 2.0 HDi 138. CITROËN C4 Picasso I MPV (UD_) 2.0 HDi 150. CITROËN C4 Picasso I MPV (UD_) 2.0 HDi 165. CITROËN C5 I (DC_) 2.0 HDi. CITROËN C5 I (DC_) 2.0 HDi (DCRHYB). CITROËN C5 I (DC_) 2.0 HDi (DCRHZB, DCRHZE). CITROËN C5 I (DC_) 2.2 HDi (DC4HXB, DC4HXE). CITROËN C5 I Estate (DE_) 2.0 HDi. CITROËN C5 I Estate (DE_) 2.0 HDi (DERHSB, DERHSE). CITROËN C5 I Estate (DE_) 2.0 HDi (DERHYB). CITROËN C5 I Estate (DE_) 2.2 HDi (DE4HXB, DE4HXE). CITROËN C5 II Break (RE_) 2.0 HDi (RERHRH). Model year from: 05/2008; Model year to: 06/2010. CITROËN C5 II Break (RE_) 2.2 HDi. Model year from: 12/2006; Model year to: 06/2010. CITROËN C5 III (RD_) 2.0 HDi. CITROËN C5 III (RD_) 2.0 HDi 140. CITROËN C5 III (RD_) 2.0 HDi 150 / BlueHDi 150. Transmission Type: Manual Transmission, 6-speed. CITROËN C5 III (RD_) 2.0 HDi 165. CITROËN C5 III Break (RW_) 2.0 HDi. CITROËN C5 III Break (RW_) 2.0 HDi 140. CITROËN C5 III Break (RW_) 2.0 HDi 150 / BlueHDi 150. CITROËN C5 III Break (RW_) 2.0 HDi 165. CITROËN C5 III Break (RW_) 2.2 HDi. CITROËN C8 (EA_, EB_) 2.0 HDi. CITROËN C8 (EA_, EB_) 2.0 HDi 165. CITROËN C8 (EA_, EB_) 2.2 HDi. Model year from: 01/2003; Model year to: 12/2006. CITROËN DISPATCH (U6U) 1.9 D.
CITROËN DISPATCH (U6U) 1.9 D 70. Model year from: 10/1998; Model year to: 08/2001. CITROËN DISPATCH (U6U) 1.9 TD. CITROËN DISPATCH (U6U) 2.0 HDi 110. CITROËN DISPATCH (U6U) 2.0 HDi 95. CITROËN DISPATCH (VF7) 2.0 HDi 125. CITROËN DISPATCH (VF7) 2.0 HDi 165. CITROËN DISPATCH (VF7) 2.0 HDi 95. CITROËN DISPATCH Box 2.0 HDi 125. CITROËN DISPATCH Box 2.0 HDi 165. CITROËN DISPATCH Box 2.0 HDi 95. CITROËN DISPATCH Platform/Chassis (BU_, BV_, BW_, BX_) 1.9 TD. CITROËN DISPATCH Platform/Chassis (BU_, BV_, BW_, BX_) 2.0 HDi 110 16V. CITROËN DISPATCH Platform/Chassis (BU_, BV_, BW_, BX_) 2.0 HDi 95. CITROËN DISPATCH Platform/Chassis 2.0 HDi 125. CITROËN DISPATCH Van (BS_, BT_, BY_, BZ_) 1.9 D 70. CITROËN DISPATCH Van (BS_, BT_, BY_, BZ_) 1.9 TD. CITROËN DISPATCH Van (BS_, BT_, BY_, BZ_) 2.0 HDi 110. CITROËN DISPATCH Van (BS_, BT_, BY_, BZ_) 2.0 HDi 95. CITROËN DS5 2.0 HDi 165. CITROËN RELAY Box (230L) 1.9 D.
Model year from: 06/1994; Model year to: 12/2001. CITROËN RELAY Box (230L) 1.9 TD. CITROËN RELAY Box (230L) 2.0 HDI. CITROËN RELAY Box (244) 2.0 HDi. CITROËN RELAY Bus (230P) 1.9 D.
CITROËN RELAY Bus (230P) 1.9 TD. CITROËN RELAY Bus (230P) 1.9 TD 4x4. CITROËN RELAY Bus (244, Z_) 2.0 HDi. CITROËN RELAY Platform/Chassis (230) 1.9 TD. CITROËN RELAY Platform/Chassis (244) 2.0 HDi. CITROËN SYNERGIE MPV (22, U6) 1.9 TD. CITROËN SYNERGIE MPV (22, U6) 2.0 HDI. CITROËN SYNERGIE MPV (22, U6) 2.0 HDI 16V. CITROËN SYNERGIE MPV (22, U6) 2.1 TD. CITROËN XANTIA (X1_, X2_) 1.9 D.
CITROËN XANTIA (X1_, X2_) 1.9 SD. CITROËN XANTIA (X1_, X2_) 1.9 Turbo D. CITROËN XANTIA (X1_, X2_) 2.0 HDI 109. CITROËN XANTIA (X1_, X2_) 2.0 HDI 90. CITROËN XANTIA (X1_, X2_) 2.1 Turbo D 12V. CITROËN XANTIA Estate (X1_, X2_) 1.9 SD. CITROËN XANTIA Estate (X1_, X2_) 1.9 Turbo D. CITROËN XANTIA Estate (X1_, X2_) 2.0 HDI 109. CITROËN XANTIA Estate (X1_, X2_) 2.0 HDI 90. CITROËN XANTIA Estate (X1_, X2_) 2.1 Turbo D 12V. CITROËN XM (Y3) 2.1 D 12V. CITROËN XM (Y3) 2.1 TD 12V. CITROËN XM (Y4) 2.1 TD 12V. CITROËN XM Estate (Y3) 2.1 D 12V. CITROËN XM Estate (Y3) 2.1 TD 12V. CITROËN XM Estate (Y4) 2.1 D12. CITROËN XM Estate (Y4) 2.1 TD 12V. CITROËN XSARA (N1) 1.8 D. CITROËN XSARA (N1) 1.9 SD. CITROËN XSARA (N1) 2.0 HDi 109. CITROËN XSARA (N1) 2.0 HDi 90. Model year from: 10/2000; Model year to: 12/2004. CITROËN XSARA Box Body / Estate 2.0 HDi. CITROËN XSARA Coupe (N0) 1.9 D. CITROËN XSARA Coupe (N0) 1.9 TD. CITROËN XSARA Coupe (N0) 2.0 HDi 109. CITROËN XSARA Coupe (N0) 2.0 HDI 90. CITROËN XSARA Estate (N2) 1.8 D. CITROËN XSARA Estate (N2) 1.9 D.
CITROËN XSARA Estate (N2) 2.0 HDi 109. CITROËN XSARA Estate (N2) 2.0 HDI 90. Model year from: 06/1999; Model year to: 12/2004. CITROËN XSARA PICASSO (N68) 2.0 HDi. Model year from: 06/2000; Model year to: 03/2006. CITROËN ZX (N2) 1.8 D. CITROËN ZX (N2) 1.9 D. CITROËN ZX (N2) 1.9 TD. CITROËN ZX Estate (N2) 1.8 D. CITROËN ZX Estate (N2) 1.9 D.
CITROËN ZX Estate (N2) 1.9 TD. FIAT DUCATO Box (230_) 1.9 D. FIAT DUCATO Box (230_) 1.9 TD. FIAT DUCATO Box (244_) 2.0 JTD. FIAT DUCATO Bus (230_) 1.9 D. FIAT DUCATO Bus (230_) 1.9 TD. FIAT DUCATO Bus (244_) 2.0 JTD. FIAT DUCATO Platform/Chassis (230_) 1.9 D. FIAT DUCATO Platform/Chassis (230_) 1.9 TD. FIAT DUCATO Platform/Chassis (244_) 2.0 JTD. FIAT SCUDO Box (220_) 1.9 D. Model year from: 06/1998; Model year to: 08/2001. FIAT SCUDO Box (220_) 1.9 TD. Model year from: 03/1997; Model year to: 05/2000. FIAT SCUDO Box (220_) 2.0 JTD. FIAT SCUDO Box (220_) 2.0 JTD 16V. Model year from: 02/2002; Model year to: 12/2005. FIAT SCUDO Combinato (220_) 1.9 D. FIAT SCUDO Combinato (220_) 1.9 TD. FIAT SCUDO Combinato (220_) 1.9 TD Eco. FIAT SCUDO Combinato (220_) 2.0 JTD. FIAT SCUDO Combinato (220_) 2.0 JTD 16V. Model year from: 10/1999; Model year to: 05/2004. FIAT ULYSSE (179_) 2.0 D Multijet. FIAT ULYSSE (179_) 2.0 JTD. Model year from: 10/2002; Model year to: 01/2006. Model year from: 06/2003; Model year to: 01/2006. FIAT ULYSSE (179_) 2.2 JTD. FIAT ULYSSE (220_) 1.9 TD (220AH5). Model year from: 10/1995; Model year to: 01/2000. FIAT ULYSSE (220_) 2.0 JTD. FIAT ULYSSE (220_) 2.0 JTD 16V. FIAT ULYSSE (220_) 2.1 TD. HYUNDAI LANTRA Mk II (J-2) 1.9 D. HYUNDAI LANTRA Mk II Estate (J-2) 1.9 D. LADA NIVA Closed Off-Road Vehicle (2121, 2131) 1900 Diesel. LANCIA PHEDRA (179_) 2.0 D Multijet. LANCIA PHEDRA (179_) 2.0 JTD. LANCIA PHEDRA (179_) 2.0 JTD (179AXB1A). LANCIA PHEDRA (179_) 2.2 JTD (179AXC1A). LANCIA ZETA (22_) 2.0 JTD. LANCIA ZETA (22_) 2.0 JTD 16V (220AN5). LANCIA ZETA (22_) 2.1 TD (220AJ5). LDV 200 Box 1.9 D. LDV PILOT Box 1.9 D. LDV PILOT Bus 1.9 D. LDV PILOT Platform/Chassis 1.9 D. MITSUBISHI OUTLANDER II (CW_W) 2.2 DI-D 4WD. PEUGEOT 205 Box 1.8 D. PEUGEOT 205 Mk II (20A/C) 1.7 Diesel. PEUGEOT 205 Mk II (20A/C) 1.8 TD. PEUGEOT 205 Mk II (20A/C) 1.8 XDT. PEUGEOT 205 Mk II (20A/C) 1.9 Diesel. PEUGEOT 205 Van 1.7 Diesel. PEUGEOT 205 (741A/C) 1.7 Diesel. PEUGEOT 206 Hatchback (2A/C) 1.9 D. PEUGEOT 206 Hatchback (2A/C) 2.0 HDI 90. PEUGEOT 206 SW (2E/K) 2.0 HDi. PEUGEOT 206 Van 1.9 D. PEUGEOT 305 Mk II (581M) 1.8 D. PEUGEOT 305 Mk II (581M) 1.9 D. PEUGEOT 305 Mk II Break (581E) 1.8 D.
PEUGEOT 305 Mk II Break (581E) 1.9 Diesel. PEUGEOT 306 (7B, N3, N5) 1.9 D. PEUGEOT 306 (7B, N3, N5) 1.9 SLD. Model year from: 07/1994; Model year to: 04/1997. PEUGEOT 306 (7B, N3, N5) 1.9 SRDT. PEUGEOT 306 (7B, N3, N5) 2.0 HDI 90. PEUGEOT 306 Box Body / Estate (N_, 7_) 1.9 D.
PEUGEOT 306 Box Body / Estate (N_, 7_) 1.9 STD. PEUGEOT 306 Break (7E, N3, N5) 1.9 D. Model year from: 05/1997; Model year to: 03/2002. Model year from: 06/1998; Model year to: 03/2002. PEUGEOT 306 Break (7E, N3, N5) 1.9 TD. Model year from: 10/1997; Model year to: 05/1999. PEUGEOT 306 Break (7E, N3, N5) 2.0 HDI 90. PEUGEOT 306 Hatchback (7A, 7C, N3, N5) 1.8 D. PEUGEOT 306 Hatchback (7A, 7C, N3, N5) 1.9 D. PEUGEOT 306 Hatchback (7A, 7C, N3, N5) 1.9 DT. PEUGEOT 306 Hatchback (7A, 7C, N3, N5) 2.0 HDI 90. PEUGEOT 307 (3A/C) 2.0 HDi 110. Model year from: 03/2002; Model year to: 05/2005. PEUGEOT 307 (3A/C) 2.0 HDi 135. PEUGEOT 307 (3A/C) 2.0 HDi 90. PEUGEOT 307 CC (3B) 2.0 HDi 135. PEUGEOT 307 Estate (3E) 2.0 HDI 110. PEUGEOT 307 Estate (3E) 2.0 HDi 135. PEUGEOT 307 Estate (3E) 2.0 HDI 90. PEUGEOT 307 SW (3H) 2.0 HDI 110. PEUGEOT 307 SW (3H) 2.0 HDi 135. PEUGEOT 307 SW (3H) 2.0 HDI 90. PEUGEOT 309 Mk II (3C, 3A) 1.8 Diesel. PEUGEOT 309 Mk II (3C, 3A) 1.8 TD. PEUGEOT 309 Mk II (3C, 3A) 1.9 Diesel. PEUGEOT 309 (10C, 10A) 1.9 D.
PEUGEOT 4007 (GP_) 2.2 HDi. PEUGEOT 405 Mk II (4B) 1.9 D. PEUGEOT 405 Mk II (4B) 1.9 TD. PEUGEOT 405 Mk II Estate (4E) 1.9 D. PEUGEOT 405 Mk II Estate (4E) 1.9 TD. PEUGEOT 405 (15B) 1.8 Turbo Diesel. PEUGEOT 405 (15B) 1.9 Diesel. PEUGEOT 405 Estate (15E) 1.8 TD. PEUGEOT 405 Estate (15E) 1.9 D. PEUGEOT 406 (8B) 1.9 D. PEUGEOT 406 (8B) 1.9 TD. PEUGEOT 406 (8B) 2.0 HDi 110. PEUGEOT 406 (8B) 2.0 HDI 110. PEUGEOT 406 (8B) 2.0 HDI 90. PEUGEOT 406 (8B) 2.1 TD 12V. PEUGEOT 406 (8B) 2.2 HDi. PEUGEOT 406 Estate (8E/F) 1.9 D. PEUGEOT 406 Estate (8E/F) 1.9 TD. PEUGEOT 406 Estate (8E/F) 2.0 HDi 110. PEUGEOT 406 Estate (8E/F) 2.0 HDI 110. PEUGEOT 406 Estate (8E/F) 2.0 HDI 90. Model year from: 04/1999; Model year to: 06/2004. PEUGEOT 406 Estate (8E/F) 2.1 TD 12V. PEUGEOT 406 Estate (8E/F) 2.2 HDi. PEUGEOT 407 (6D_) 2.0 HDi. PEUGEOT 407 (6D_) 2.0 HDi 135. PEUGEOT 407 SW (6E_) 2.0 HDi. PEUGEOT 407 SW (6E_) 2.0 HDi 135. PEUGEOT 605 (6B) 2.1 D. PEUGEOT 605 (6B) 2.1 TD 12V. PEUGEOT 605 (6B) 2.1 Turbo Diesel. PEUGEOT 607 (9D, 9U) 2.0 HDI. PEUGEOT 607 (9D, 9U) 2.0 HDi. PEUGEOT 607 (9D, 9U) 2.2 HDi. PEUGEOT 806 (221) 1.9 TD. PEUGEOT 806 (221) 2.0 HDI. PEUGEOT 806 (221) 2.0 HDI 16V. PEUGEOT 806 (221) 2.1 td 12V. PEUGEOT 807 (E) 2.0 HDi. PEUGEOT 807 (E) 2.2 HDi. PEUGEOT BOXER Box (230L) 1.9 D. PEUGEOT BOXER Box (230L) 1.9 TD. PEUGEOT BOXER Box (230L) 2.0 HDI. Model year from: 09/2001; Model year to: 02/2002. PEUGEOT BOXER Box (244) 2.0 HDi. PEUGEOT BOXER Box (244) 2.2 HDi. PEUGEOT BOXER Bus (230P) 1.9 D. PEUGEOT BOXER Bus (230P) 1.9 TD. PEUGEOT BOXER Bus (230P) 1.9 TD 4x4. PEUGEOT BOXER Bus (244, Z_) 2.0 HDi. PEUGEOT BOXER Bus (244, Z_) 2.2 HDi. PEUGEOT BOXER Platform/Chassis (244) 2.0 HDi. PEUGEOT BOXER Platform/Chassis (244) 2.2 HDi. PEUGEOT BOXER Platform/Chassis (ZCT_) 1.9 TD. PEUGEOT EXPERT (224_) 1.9 D. PEUGEOT EXPERT (224_) 1.9 TD. PEUGEOT EXPERT (224_) 2.0 HDI. PEUGEOT EXPERT (224_) 2.0 HDi. PEUGEOT EXPERT (224_) 2.0 HDI 16V. PEUGEOT EXPERT Platform/Chassis (223) 1.9 D. PEUGEOT EXPERT Platform/Chassis (223) 1.9 TD. PEUGEOT EXPERT Platform/Chassis (223) 2.0 HDi. PEUGEOT EXPERT Van (222) 1.9 D. PEUGEOT EXPERT Van (222) 1.9 D 70. PEUGEOT EXPERT Van (222) 1.9 TD. PEUGEOT EXPERT Van (222) 2.0 HDI. PEUGEOT J5 Box (280L) 1.9 D.
PEUGEOT J5 Box (290L) 1.9 D. PEUGEOT J5 Bus (290P) 1.9 D. PEUGEOT J5 Platform/Chassis (290L) 1.9 D. PEUGEOT PARTNER ORIGIN (5F) 1.9 D. Model year from: 07/1996; Model year to: 08/2002. PEUGEOT PARTNER ORIGIN (5F) 2.0 HDI. PEUGEOT PARTNER ORIGIN Van (5) 1.8 D. PEUGEOT PARTNER ORIGIN Van (5) 1.9 D. Model year from: 11/1998; Model year to: 08/2002. PEUGEOT PARTNER ORIGIN Van (5) 2.0 HDi. SUZUKI SAMURAI Closed Off-Road Vehicle (SJ) 1.9 TD All-wheel Drive (SJ 419TD). SUZUKI VITARA (ET, TA) 1.9 D All-wheel Drive (SE 419TD). SUZUKI VITARA Cabrio (ET, TA) 1.9 D (SE 419TD). TALBOT EXPRESS 1000 -1500 Bus 1.9 D. TALBOT EXPRESS 1000 -1800 Van 1.9 D. TALBOT HORIZON 1.9 Diesel. The item "LADA NIVA 1.9D Starter Motor 93 to 99 B&B Genuine Top Quality Replacement New" is in sale since Friday, January 25, 2019. This item is in the category "Vehicle Parts & Accessories\Car Parts\Electrical Components\Starter Motors".